Tucson (/ˈtuːsɒn, tuːˈsɒn/) is a city and the county seat of Pima County, Arizona, United States, and home to the University of Arizona. The 2010 United States Census put the population at 520,116, while the 2015 estimated population of the entire Tucson metropolitan statistical area (MSA) was 980,263. The Tucson MSA forms part of the larger Tucson-Nogales combined statistical area (CSA), with a total population of 1,010,025 as of the 2010 Census. Tucson is the second-largest populated city in Arizona behind Phoenix, both of which anchor the Arizona Sun Corridor. The city is 108 miles (174 km) southeast of Phoenix and 60 mi (97 km) north of the U.S.–Mexico border. Tucson is the 33rd largest city and the 58th largest metropolitan area in the United States (2014). The Spanish name of the city, Tucsón [tukˈson], is derived from the O'odham Cuk Ṣon [tʃʊk ʂɔːn], meaning "(at the) base of the black [hill]", a reference to a basalt-covered hill now known as Sentinel Peak, also known as "A" Mountain. Tucson is sometimes referred to as "The Old Pueblo". 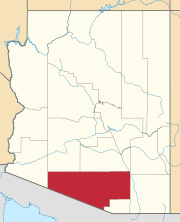 "The Old Pueblo", "Optics Valley"
Location of Tucson in Pima County, Arizona. Tucson was probably first visited by Paleo-Indians, known to have been in southern Arizona about 12,000 years ago. Recent archaeological excavations near the Santa Cruz River found a village site dating from 2100 BC. The floodplain of the Santa Cruz River was extensively farmed during the Early Agricultural Period, circa 1200 BC to AD 150. These people constructed irrigation canals and grew corn, beans, and other crops while gathering wild plants and hunting. The Early Ceramic period occupation of Tucson saw the first extensive use of pottery vessels for cooking and storage. The groups designated as the Hohokam lived in the area from AD 600 to 1450 and are known for their vast irrigation canal systems and their red-on-brown pottery. Jesuit missionary Eusebio Francisco Kino visited the Santa Cruz River valley in 1692, and founded the Mission San Xavier del Bac in 1700 about 7 mi (11 km) upstream from the site of the settlement of Tucson. A separate Convento settlement was founded downstream along the Santa Cruz River, near the base of what is now "A" mountain. Hugo O'Conor, the founding father of the city of Tucson, Arizona authorized the construction of a military fort in that location, Presidio San Agustín del Tucsón, on August 20, 1775 (near the present downtown Pima County Courthouse). During the Spanish period of the presidio, attacks such as the Second Battle of Tucson were repeatedly mounted by Apaches. Eventually the town came to be called "Tucson" and became a part of the state of Sonora after Mexico gained independence from the Kingdom of Spain and its Spanish Empire in 1821. Tucson was captured by Philip St. George Cooke with the Mormon Battalion during the Mexican–American War in 1846-1848, but it soon returned to Mexican control as Cooke continued his mission westward establishing Cooke's Wagon Road to California. Tucson was not included in the Mexican Cession and Cooke's road through Tucson became one of the important routes into California during the California Gold Rush of 1849. Arizona, south of the Gila River, was obtained via treaty from Mexico in the Gadsden Purchase on June 8, 1854. Tucson became a part of the United States of America, although the American military did not formally take over control until March 1856. In 1857, Tucson became a stage station on the San Antonio-San Diego Mail Line and in 1858 became 3rd division headquarters of the Butterfield Overland Mail until the line shut down in March 1861. The Overland Mail Corporation attempted to continue running; however, following the Bascom Affair, devastating Apache attacks on the stations and coaches ended operations in August 1861. From 1877 to 1878, the area suffered a rash of stagecoach robberies. Most notable were the two holdups committed by masked road-agent William Whitney Brazelton. Brazelton held up two stages in the summer of 1878 near Point of Mountain Station approximately 17 mi (27 km) northwest of Tucson. John Clum, of Tombstone, Arizona fame was one of the passengers. Pima County Sheriff Charles A. Shibell and his citizen posse killed Brazelton on Monday August 19, 1878, in a mesquite bosque along the Santa Cruz River 3 miles (5 km) south of Tucson. Brazelton had been suspected of highway robbery in the Tucson area, the Prescott region and Silver City, New Mexico area. Brazelton's crimes prompted John J. Valentine, Sr. of Wells, Fargo & Co. to send special agent and future Pima County sheriff Bob Paul to investigate. Fort Lowell, then east of Tucson, was established to help protect settlers from Apache attacks. In 1882, Frank Stilwell was implicated in the murder of Morgan Earp by Cowboy Pete Spence's wife, Marietta, at the coroner's inquest on Morgan Earp's shooting. The coroner's jury concluded Spence, Stilwell, Frederick Bode, and Florentino "Indian Charlie" Cruz were the prime suspects in the assassination of Morgan Earp. :250 Deputy U.S. Marshal Wyatt Earp gathered a few trusted friends and accompanied Virgil Earp and his family as they traveled to Benson for a train ride to California. They found Stilwell lying in wait for Virgil in the Tucson station and killed him on the tracks. After killing Stilwell, Wyatt deputized others and rode on a vendetta, killing three more cowboys over the next few days before leaving the state. In 1885, the University of Arizona was founded as a land-grant college on over-grazed ranch land between Tucson and Fort Lowell. In 1890, Asians made up 4.2% of the city's population. By 1900, 7,531 people lived in the city. The population increased to 13,913 in 1910. At about this time, the U.S. Veterans Administration had begun construction on the present Veterans Hospital. The city's clean, dry air attracted many veterans who had been gassed in World War I and needed respiratory therapy. The city continued to grow, with the population increasing to 20,292 in 1920 and 36,818 in 1940. In 2006, the population of Pima County, in which Tucson is located, passed one million, while the City of Tucson's population was 535,000. According to the United States Census Bureau, as of 2010, the City of Tucson has a land area of 226.71 square miles (587.2 km2). The city's elevation is 2,643 ft (806 m) above sea level (as measured at the Tucson International Airport). Tucson is on an alluvial plain in the Sonoran desert, surrounded by five minor ranges of mountains: the Santa Catalina Mountains and the Tortolita Mountains to the north, the Santa Rita Mountains to the south, the Rincon Mountains to the east, and the Tucson Mountains to the west. The high point of the Santa Catalina Mountains is 9,157 ft (2,791 m) Mount Lemmon, the southernmost ski destination in the continental U.S., while the Tucson Mountains include 4,687 ft (1,429 m) Wasson Peak. The highest point in the area is Mount Wrightson, found in the Santa Rita Mountains at 9,453 ft (2,881 m) above sea level. Tucson is 118 mi (190 km) southeast of Phoenix and 60 mi (97 km) north of the United States - Mexico border. The 2010 United States Census puts the city's population at 520,116 with a metropolitan area population at 980,263. In 2009, Tucson ranked as the 32nd largest city and 52nd largest metropolitan area in the United States. A major city in the Arizona Sun Corridor, Tucson is the largest city in southern Arizona, the second largest in the state after Phoenix. It is also the largest city in the area of the Gadsden Purchase. As of 2015, The Greater Tucson Metro area has exceeded a population of 1 million. The city is on the Santa Cruz River, formerly a perennial river, but now a dry river bed for much of the year that floods during significant seasonal rains. At the end of the first decade of the 21st century, downtown Tucson underwent a revitalization effort by city planners and the business community. The primary project was Rio Nuevo, a large retail and community center that has been stalled in planning for more than ten years. Downtown is generally regarded as the area bordered by 17th Street to the south, I-10 to the west, and 6th Street to the north, and Toole Avenue and the Union Pacific (formerly Southern Pacific) railroad tracks, site of the historic train depot and "Locomotive #1673", built in 1900. Downtown is divided into the Presidio District, the Barrio Viejo, and the Congress Street Arts and Entertainment District. Some authorities include the 4th Avenue shopping district, which is set just northeast of the rest of downtown and connected by an underpass beneath the UPRR tracks. The recently restored Fox Theatre is in downtown Tucson. As one of the oldest parts of town, Central Tucson is anchored by the Broadway Village shopping center. The shopping center was designed by local architect Josias Joesler and sits at the intersection of Broadway Boulevard and Country Club Road. The 4th Avenue Shopping District between downtown, the university, and the Lost Barrio just East of downtown, also have many unique and popular stores. Local retail business in Central Tucson is densely concentrated along Fourth Avenue and the Main Gate Square on University Boulevard near the UA campus. The El Con Mall is also in the eastern part of midtown. The University of Arizona, chartered in 1885, is in midtown and includes Arizona Stadium and McKale Center (named for J.F. "Pop" McKale). Historic Tucson High School (designed by Roy Place in 1924) featured in the 1987 film Can't Buy Me Love, the Arizona Inn (built in 1930), and the Tucson Botanical Gardens are also in Central Tucson. Tucson's largest park, Reid Park, is in midtown and includes Reid Park Zoo and Hi Corbett Field. Speedway Boulevard, a major east-west arterial road in central Tucson, was named the "ugliest street in America" by Life magazine in the early 1970s, quoting Tucson Mayor James Corbett. Despite this, Speedway Boulevard was awarded "Street of the Year" by Arizona Highways in the late 1990s. According to David Leighton, historical writer for the Arizona Daily Star newspaper, Speedway Boulevard derives its name from an old horse racetrack, known as "The Harlem River Speedway," more commonly called "The Speedway," in New York City. The street was called "The Speedway," from 1904 to about 1906 before the word "The" was taken out. Central Tucson is bicycle-friendly. To the east of the University of Arizona, Third Street is bike-only except for local traffic and passes by the historic homes of the Sam Hughes neighborhood. To the west, E. University Boulevard leads to the Fourth Avenue Shopping District. To the North, N. Mountain Avenue has a full bike-only lane for half of the 3.5 miles (5.6 km) to the Rillito River Park bike and walk multi-use path. To the south, N. Highland Avenue leads to the Barraza-Aviation Parkway bicycle path. South Tucson is actually the name of an independent, incorporated town of 1 sq mi (2.6 km2), completely surrounded by the city of Tucson, just south of downtown. South Tucson has a colorful, dynamic history. It was first incorporated in 1936, and later reincorporated in 1940. The population consists of about 83% Mexican-American and 10% Native American residents. South Tucson is widely known for its many Mexican restaurants and the architectural styles which include bright outdoor murals, many of which have been painted over due to city policy. The South side of the city of Tucson is generally considered to be the area of approximately 25 sq mi (65 km2) north of Los Reales Road, south of 22nd Street, east of I-19, west of Davis Monthan Air Force Base and southwest of Aviation Parkway. The Tucson International Airport and Tucson Electric Park are here. A combination of urban and suburban development, the West Side is generally defined as the area west of I-10. Western Tucson encompasses the banks of the Santa Cruz River and the foothills of the Tucson Mountains, and includes the International Wildlife Museum, Sentinel Peak, and the Marriott Starr Pass Resort & Spa, in the wealthy enclave known as Starr Pass. Moving past the Tucson Mountains, travelers find themselves in the area commonly referred to as "west of" Tucson or "Old West Tucson". A large undulating plain extending south into the Altar Valley, rural residential development predominates, but here you will also find major attractions including Saguaro National Park West, the Arizona-Sonora Desert Museum, and the Old Tucson Studios movie set/theme park. On Sentinel Peak (also known as "'A' Mountain"), just west of downtown, there is a giant "A" in honor of the University of Arizona. Starting in about 1916, a yearly tradition developed for freshmen to whitewash the "A", which was visible for miles. However, at the beginning of the Iraq War, anti-war activists painted it black. This was followed by a paint scuffle where the "A" was painted various colors until the city council intervened. It is now red, white and blue except when it is white or another color decided by a biennial election. Because of the three-color paint scheme often used, the shape of the A can be vague and indistinguishable from the rest of the peak. The top of Sentinel Peak, which is accessible by road, offers an outstanding scenic view of the city looking eastward. A parking lot near the summit of Sentinel Peak was a popular place to watch sunsets or view the city lights at night. North Tucson includes the urban neighborhoods of Amphitheater and Flowing Wells. Usually considered the area north of Fort Lowell Road, North Tucson includes some of Tucson's primary commercial zones (Tucson Mall and the Oracle Road Corridor). Many of the city's most upscale boutiques, restaurants, and art galleries are also on the north side, including St. Philip's Plaza. The Plaza is directly adjacent to the historic St. Philip's in the Hills Episcopal Church (built in 1936). Also on the north side is the suburban community of Catalina Foothills, located in the foothills of the Santa Catalina Mountains just north of the city limits. This community includes among the area's most expensive homes, sometimes multimillion-dollar estates. The Foothills area is generally defined as north of River Road, east of Oracle Road and west of Sabino Creek. Some of the Tucson area's major resorts are in the Catalina Foothills, including the Hacienda Del Sol, Westin La Paloma Resort, Loews Ventana Canyon Resort and Canyon Ranch Resort. La Encantada, an upscale outdoor shopping mall, is also in the Foothills. The DeGrazia Gallery of the Sun is near the intersection of Swan Road and Skyline Drive. Built by artist Ted DeGrazia starting in 1951, the 10-acre (40,000 m2) property is listed on the National Register of Historic Places and features an eclectic chapel, an art gallery, and a free museum. The expansive area northwest of the city limits is diverse, ranging from the rural communities of Catalina and parts of the town of Marana, the small suburb of Picture Rocks, the affluent town of Oro Valley in the western foothills of the Santa Catalina Mountains, and residential areas in the northeastern foothills of the Tucson Mountains. Continental Ranch (Marana), Dove Mountain (Marana), and Rancho Vistoso (Oro Valley) are all masterplanned communities in the Northwest that have thousands of residents. The community of Casas Adobes is also on the Northwest Side, with the distinction of being Tucson's first suburb, established in the late 1940s. Casas Adobes is centered on the historic Casas Adobes Plaza (built in 1948). Casas Adobes is also home to Tohono Chul Park, which is now within the town of Oro Valley, (a nature preserve) near the intersection of North Oracle Road and West Ina Road. The attempted assassination of Representative Gabrielle Giffords, and the murders of chief judge for the U.S. District Court for Arizona, John Roll and five other people on January 8, 2011, occurred at the La Toscana Village in Casas Adobes. The Foothills Mall is also on the northwest side in Casas Adobes. Many of the Tucson area's golf courses and resorts are in this area, including the The Preserve and MountainView Golf Clubs at Saddlebrooke, Hilton El Conquistador Golf & Tennis Resort in Oro Valley, the Omni Tucson National Resort & Spa, and Westward Look Resort. The Ritz Carlton at Dove Mountain, the second Ritz Carlton Resort in Arizona, which also includes a golf course, opened in the foothills of the Tortolita Mountains in northeast Marana in 2009. Catalina State Park and Tortolita Mountain Park are also in the Northwest area. East Tucson is relatively new compared to other parts of the city, developed between the 1950s and the 1970s, with developments such as Desert Palms Park. It is generally classified as the area of the city east of Swan Road, with above-average real estate values relative to the rest of the city. The area includes urban and suburban development near the Rincon Mountains. East Tucson includes Saguaro National Park East. Tucson's "Restaurant Row" is also on the east side, along with a significant corporate and financial presence. Restaurant Row is sandwiched by three of Tucson's storied Neighborhoods: Harold Bell Wright Estates, named after the famous author's ranch which occupied some of that area before the depression; the Tucson Country Club (the third to bear the name Tucson Country Club), and the Dorado Country Club. Tucson's largest office building is 5151 East Broadway in east Tucson, completed in 1975. The first phases of Williams Centre, a mixed-use, master-planned development on Broadway near Craycroft Road, were opened in 1987. Park Place, a recently renovated shopping center, is also along Broadway (west of Wilmot Road). Southeast Tucson continues to experience rapid residential development. The area includes Davis-Monthan Air Force Base. The area is considered to be south of Golf Links Road. It is the home of Santa Rita High School, Chuck Ford Park (Lakeside Park), Lakeside Lake, Lincoln Park (upper and lower), The Lakecrest Neighborhoods, and Pima Community College East Campus. The Atterbury Wash with its access to excellent bird watching is also in the Southeast Tucson area. The suburban community of Rita Ranch houses many of the military families from Davis-Monthan, and is near the southeastern-most expansion of the current city limits. Close by Rita Ranch and also within the city limits lies Civano, a planned development meant to showcase ecologically sound building practices and lifestyles. Mount Lemmon, the highest peak of the Santa Catalina Mountains, reaches an elevation of 9,157 feet (2,791 m) above sea level. The mountain is named after 19th century botanist Sara Lemmon. She was the first documented European woman to ascend to the peak, accompanied by her husband and by local rancher Emmerson Oliver Stratton. The Lemmons botanized extensively along the way, including collecting the plant Tagetes lemmonii which is now called the Mount Lemmon marigold. Catalina Highway stretches 25 miles (40 km) and the entire mountain range is one of Tucson's most popular vacation spots for cycling, hiking, rock climbing, camping, birding, and wintertime snowboarding and skiing. Near the top of Mt. Lemmon is the town of Summerhaven. In Summerhaven, visitors will find log houses and cabins, a general store, and various shops, as well as numerous hiking trails. Near Summerhaven is the road to Ski Valley which hosts a ski lift, several runs, a giftshop, and nearby restaurant. Mt. Lemmon Sky Center, which is at a Steward Observatory site known as 'Sky Island', sits 9,152 feet (2,790 m) in altitude on the summit of Mt. Lemmon. As one of the Southwestern United States's 27 unique Sky Islands, this science learning facility is open to the public. Summer is characterized by daytime temperatures of over 100 °F (38 °C) and overnight temperatures between 66 and 85 °F (19 and 29 °C). Early summer is characterized by low humidity and clear skies; mid-summer and late summer are characterized by higher humidity, cloudy skies and frequent rain. The sun is intense in Tucson during part of the year, and significant protection is needed for those who spend time outdoors. Recent studies show the rate of skin cancer in Arizona is at least three times higher than in more northerly regions. Additional intense heating is a risk to hikers and others who seek to hike canyons and exposed areas. The monsoon season typically begins from early July to late July, with an average start date around July 3. It typically continues through August and sometimes into September. During the monsoon, the humidity is much higher than the rest of the year. It begins with clouds building up from the south in the early afternoon followed by intense thunderstorms and rainfall, which can cause flash floods. The evening sky at this time of year is often pierced with dramatic lightning strikes. Large areas of the city do not have storm sewers, so monsoon rains flood the main thoroughfares, usually for no longer than a few hours. A few underpasses in Tucson have "feet of water" scales painted on their supports to discourage fording by automobiles during a rainstorm. Arizona traffic code Title 28-910, the so-called "Stupid Motorist Law", was instituted in 1995 to discourage people from entering flooded roadways. If the road is flooded and a barricade is in place, motorists who drive around the barricade can be charged up to $2000 for costs involved in rescuing them. Despite all warnings and precautions, however, three Tucson drivers have drowned between 2004 and 2010. The weather in the fall is much like spring: dry, with warm/cool nights and warm/hot days. Temperatures above 100 °F (38 °C) are possible into early October. Temperatures decline at the quickest rate in October and November, and are normally the coolest in late December and early January. Winters in Tucson are mild relative to other parts of the United States. Daytime highs range between 64 and 75 °F (18 and 24 °C), with overnight lows between 30 and 44 °F (−1 and 7 °C). Tucson typically averages one hard freeze per winter season, with temperatures dipping to the mid or low-20s (−7 to −4 °C), but this is typically limited to only a very few nights. Although rare, snow has fallen in Tucson, usually a light dusting that melts within a day. The most recent snowfall was on February 22, 2019 when 1.9 inches of snow fell in the city. This snow occurred only 52 days after the last snow, which occurred on January 2. Early spring is characterized by gradually rising temperatures and several weeks of vivid wildflower blooms beginning in late February and into March. During this time of year the diurnal temperature variation normally attains its maximum, often surpassing 30 °F (17 °C). At the University of Arizona, where records have been kept since 1894, the record maximum temperature was 115 °F (46 °C) on June 19, 1960, and July 28, 1995, and the record minimum temperature was 6 °F (−14 °C) on January 7, 1913. There are an average of 150.1 days annually with highs of 90 °F (32 °C) or higher and an average of 26.4 days with lows reaching or below the freezing mark. Average annual precipitation is 11.15 in (283 mm). There is an average of 49 days with measurable precipitation. The wettest year was 1905 with 24.17 in (614 mm) and the driest year was 1924 with 5.07 in (129 mm). The most precipitation in one month was 7.56 in (192 mm) in July 1984. The most precipitation in 24 hours was 4.16 in (106 mm) on October 1, 1983. Annual snowfall averages 0.7 in (1.8 cm). The most snow in one year was 7.2 in (18 cm) in 1987. The most snow in one month was 6.0 in (15 cm) in January 1898 and March 1922. At the airport, where records have been kept since 1930, the record maximum temperature was 117 °F (47 °C) on June 26, 1990, and the record minimum temperature was 16 °F (−9 °C) on January 4, 1949. There is an average of 145.0 days annually with highs of 90 °F (32 °C) or higher and an average of 16.9 days with lows reaching or below the freezing mark. Measurable precipitation falls on an average of 53 days. The wettest year was 1983 with 21.86 in (555 mm) of precipitation, and the driest year was 1953 with 5.34 in (136 mm). The most rainfall in one month was 7.93 in (201 mm) in August 1955. The most rainfall in 24 hours was 3.93 in (100 mm) on July 29, 1958. Snow at the airport averages only 1.1 in (2.8 cm) annually. The most snow received in one year was 8.3 in (21 cm) and the most snow in one month was 6.8 in (17 cm) in December 1971. Downtown Tucson with the University of Arizona in the background. Much of Tucson's economic development has been centered on the development of the University of Arizona, which is currently the second largest employer in the city. Davis-Monthan Air Force Base, on the city's southeastern edge, also provides many jobs for Tucson residents. Its presence, as well as the presence of the US Army Intelligence Center (Fort Huachuca, the largest employer in the region in nearby Sierra Vista), has led to the development of many high-tech industries, including government contractors, in the area. The city of Tucson is also a major hub for the Union Pacific Railroad's Sunset Route that links the Los Angeles ports with the South/Southeast regions of the country. There are also a number of middle-class and upper-class Sonorans and Sinaloans who travel from Mexico to Tucson to purchase goods not readily available in Mexico. Sailors take part in the annual St. Patrick's Day parade. Since 2012, during the first two weekends of October, the Tucson Historic Preservation Foundation hosts Tucson Modernism Week. The event includes more than 30 programs including tours, lectures, exhibits, films and parties. The events are in mid-century modern buildings and neighborhoods throughout the city and has highlighted the work of significant architects and designers who contributed to the development and history of southern Arizona including: Architect Arthur Brown, Fashion Designer Dolores Gonzales, Architect Bob Swaim, Architect Anne Rysdale, Textile Designers Harwood and Sophie Steiger, Architect Nick Sakellar, Architectural Designer Tom Gist, Furniture Designer Max Gottschalk, Architect, Ned Nelson, Landscape Architect Guy Green, Architect Juan Worner Baz and many others. The All Souls Procession, held in early November, is one of the largest festivals in Tucson. Modeled on the Mexican holiday Dia de los Muertos (Day of the Dead), it combines aspects of many different cultural traditions. The first All Souls Procession was organized by local artist Susan Kay Johnson in 1990 and involved 35 participants; by 2013, participation was estimated at 50,000. The Procession, held at sundown, consists of a non-motorized parade through downtown Tucson featuring many floats, sculptures, and memorials, in which the community is encouraged to participate. The parade is followed by performances on an outdoor stage, culminating in the burning of an urn in which written prayers have been collected from participants and spectators. The event is organized and funded by the non-profit arts organization Many Mouths One Stomach, with the assistance of many volunteers and donations from the public and local businesses. International Wildlife Museum, which is 5 mi (8.0 km) west of Interstate 10, maintains an exhibition of over four-hundred different mounted and prepared animal species hunted from around the globe. Titan Missile Museum is about 25 mi (40 km) south of the city on I-19. This is a Cold War era Titan nuclear missile silo (billed as the only remaining intact post-Cold War Titan missile silo) turned tourist stop. Fourth Avenue, near the University of Arizona, is home to many shops, restaurants, and bars, and hosts the annual 4th Avenue Street Fair every December and March. University Boulevard, leading directly to the UA Main Gate, is also the center of numerous bars, retail shops, and restaurants most commonly frequented by the large student population of the UA. Musical organizations include the Tucson Symphony Orchestra (founded in 1929) and Arizona Opera (founded as the Tucson Opera Company in 1971). The Tucson Arizona Boys Chorus, founded in 1939 and performing a wide-ranging repertoire that incorporates rope tricks, has represented the city as "Ambassadors in Levi's" at local, national, and international concerts. The Tucson Girls Chorus runs six choirs and numerous satellite choirs which perform locally, nationally, and internationally. Prominent musical artists based in Tucson have included Linda Ronstadt, The Dusty Chaps, Howe Gelb, Bob Log III, Calexico, Giant Sand, Hipster Daddy-O and the Handgrenades, The Bled, Ramshackle Glory, and Tucson's official troubadour Ted Ramirez. The Tucson Area Music Awards, or TAMMIES, are an annual event. Tucson is well known for its Sonoran-style Mexican food. But since the turn of the century, ethnic restaurants and fine dining choices have proliferated. In 2015 the United Nations Educational, Scientific and Cultural Organization (UNESCO) designated Tucson a "world city of gastronomy" under the Creative Cities Network program, becoming thus the first city of gastronomy in the United States. The Sonoran hot dog is very popular in Tucson. This is a hot dog wrapped in bacon and grilled, served on a bolillo-style hot dog bun, and topped with pinto beans, onions, tomatoes, and a variety of additional condiments, often including mayonnaise, mustard, and jalapeño salsa. Tucson is not represented in any of the four major sports leagues of the United States; the NFL, MLB, the NBA, or the NHL. The University of Arizona Wildcats teams, most notably the men's basketball and women's softball teams have strong local interest. The men's basketball team, formerly coached by Hall of Fame head coach Lute Olson and currently coached by Sean Miller, has made 25 straight NCAA Tournaments and won the 1997 National Championship. Arizona's Softball team has reached the NCAA National Championship game 12 times and has won 8 times, most recently in 2007. The men's baseball team has won NCAA National Championships in 1976, 1980, 1986 and 2012. The university's swim teams have gained international recognition, with swimmers coming from as far as Japan and Africa to train with the coach Frank Busch who has also worked with the U.S. Olympic swim team for a number of years. Both men's and women's swim teams won the 2008 NCAA National Championships. The Tucson Saguaros of the independent Pecos League started play in 2016 and play at Cherry Field. They won the league in their inaugural season. The Tucson Padres played at Kino Veterans Memorial Stadium from 2011 to 2013. They served as the AAA affiliate of the San Diego Padres. The team, formerly known as the Portland Beavers, temporarily moved to Tucson from Portland while the team awaited a new stadium in Escondido. Legal issues derailed the plans to build the Escondido stadium, so they moved to El Paso, Texas for the 2014 season. Previously, the Tucson Sidewinders, a triple-A affiliate of the Arizona Diamondbacks, won the Pacific Coast League championship and unofficial AAA championship in 2006. The Sidewinders played in Tucson Electric Park and were in the Pacific Conference South of the PCL. The Sidewinders were sold in 2007 and moved to Reno, Nevada after the 2008 season. They now compete as the Reno Aces. The Springfield Falcons of the American Hockey League moved to Tucson following the 2015-2016 season to become the Tucson Roadrunners. They play in the AHL's Pacific division, and are affiliated with the Arizona Coyotes. Tucson is also host to the Mobile Mini Sun Cup, the largest pre-season Major League Soccer (MLS) tournament in the country. As many as 11 MLS soccer clubs train in Tucson every winter. Tucson is also host to FC Tucson, a professional soccer club that currently plays in the third-tier USL League One and is affiliated with second-tier USL Championship side Phoenix Rising FC. The United States Handball Association Hall of Fame is in Tucson. Tracks include Tucson Raceway Park and Rillito Downs. Tucson Raceway Park hosts NASCAR-sanctioned auto racing events and is one of only two asphalt short tracks in Arizona. Rillito Downs is an in-town destination on weekends in January and February each year. This historic track held the first organized quarter horse races in the world, and they are still racing there. The racetrack is threatened by development. The Moltacqua racetrack, was another historic horse racetrack on what is now Sabino Canyon Road and Vactor Ranch Trail, but it no longer exists. In 2018, the Indoor Football League announced they were bringing an expansion team to Tucson to play at the Tucson Convention Center's newly-renovated Tucson Arena. That team would be announced as the Tucson Sugar Skulls. The city has more than 120 parks, from small and local to larger parks with ballfields, natural areas, lakes, 5 public golf courses, and Reid Park Zoo. "The Loop" is a popular system of walking/running/bicycling/horseback trails encircling the city primarily along washes, and it is usually well separated from traffic. Several scenic parks and points of interest are also nearby, including the Tucson Botanical Gardens, Tohono Chul Park, Saguaro National Park, Sabino Canyon, and Biosphere 2 (just north of the city, near the town of Oracle). Mt. Lemmon is 25 miles (40 km) north (by road) and over 6,700 feet (2,000 m) above Tucson in the Santa Catalina Mountains in the Coronado National Forest. Outdoor activities in the Catalinas include hiking, mountain biking, birding, rock climbing, picnicking, camping, swimming in mountain stream pools, sky rides at Ski Valley, fishing and photography. In winter with enough snow the sky ride converts back to skiing at the southernmost ski resort in the continental United States. Summerhaven, a community near the top of Mt. Lemmon, is also a popular destination. In general, Tucson and Pima County support the Democratic Party, as opposed the state's largest metropolitan area, Phoenix, which usually supports the Republican Party. Congressional redistricting in 2013, following the publication of the 2010 Census, divided the Tucson area into three Federal Congressional districts (the first, second and third of Arizona). The city center is in the 3rd District, represented by Raul Grijalva, a Democrat, since 2003, while the more affluent residential areas to the south and east are in the 2nd District, represented by Democrat Ann Kirkpatrick since 2019, and the exurbs north and west between Tucson and Phoenix in the 1st District are represented by Democrat Tom O'Halleran since 2016. The United States Postal Service operates post offices in Tucson. The Tucson Main Post Office is at 1501 South Cherrybell Stravenue. Tucson follows the "weak mayor" model of the council-manager form of local government. The 6-member city council holds exclusive legislative authority, and shares executive authority with the mayor, who is elected by the voters independently of the council. An appointed city manager is responsible for the day-to-day operations of the city. Tucson is the only city in Arizona that holds officially partisan elections for city offices, with candidates being nominated through party primaries. Primarily, students of the Tucson area attend public schools in the Tucson Unified School District (TUSD). TUSD has the second highest enrollment of any school district in Arizona, behind Mesa Unified School District in the Phoenix metropolitan area. There are also many publicly funded charter schools with a specialized curriculum. Tucson's primary electrical power source is a coal and natural gas power-plant managed by Tucson Electric Power that is situated within the city limits on the south-western boundary of Davis-Monthan Air-force base adjacent to Interstate-10. The air pollution generated has raised some concerns as the Sundt operating station has been online since 1962 and is exempt from many pollution standards and controls due to its age. Solar has been gaining ground in Tucson with its ideal over 300 days of sunshine climate. Federal, state, and even local utility credits and incentives have also enticed residents to equip homes with solar systems. Davis-Monthan AFB has a 3.3 Megawatt (MW) ground-mounted solar photovoltaic (PV) array and a 2.7 MW rooftop-mounted PV array, both of which are in the Base Housing area. The base will soon have the largest solar-generating capacity in the United States Department of Defense after awarding a contract on September 10, 2010, to SunEdison to construct a 14.5 MW PV field on the northwestern side of the base. Global Solar Energy, which is at the University of Arizona's science and technology park, is one of the planet's largest CIGS solar fields at 750 kilowatts. In an effort to conserve water, Tucson is recharging groundwater supplies by running part of its share of CAP water into various open portions of local rivers to seep into their aquifer. Additional study is scheduled to determine how much water is lost through evaporation from the open areas, especially during the summer. The City of Tucson provides reclaimed water to its inhabitants, but it is only used for "applications such as irrigation, dust control, and industrial uses." These resources have been in place for more than 27 years, and deliver to over 900 locations. To prevent further loss of groundwater, Tucson has been involved in water conservation and groundwater preservation efforts, shifting away from its reliance on a series of Tucson area wells in favor of conservation, consumption-based pricing for residential and commercial water use, and new wells in the more sustainable Avra Valley aquifer, northwest of the city. An allocation from the Central Arizona Project Aqueduct (CAP), which passes more than 300 mi (480 km) across the desert from the Colorado River, has been incorporated into the city's water supply, annually providing over 20 million gallons of "recharged" water which is pumped into the ground to replenish water pumped out. Since 2001, CAP water has allowed the city to remove or turn off over 80 wells. Tucson's Sun Tran bus system serves greater Tucson with standard, express, regional shuttle, and on-demand shuttle bus service. It was awarded Best Transit System in 1988 and 2005. A 3.9-mile streetcar line, Sun Link, connects the University of Arizona campus with 4th Avenue, downtown, and the Mercado District west of Interstate 10 and the Santa Cruz River. Ten-minute headway passenger service began July 25, 2014. The streetcar uses Sun Tran's card payment and transfer system, connecting with the University of Arizona's CatTran shuttles, Amtrak, and Greyhound intercity bus service. Tucson International Airport (IATA: TUS, ICAO: KTUS), is 6 mi (9.7 km) south of the city's center. TIA is the second largest commercial airport in Arizona, providing nonstop flights to 15 destinations throughout the United States. In addition to passenger and freight service, TIA supports the 162d Fighter Wing's fleet of seventy F-16s stationed at the Tucson Air National Guard Base. There are 2 general aviation reliever airports in the area. The city of Tucson operates Ryan Airfield 13 miles southwest of the city center, and the town of Marana operates Marana Regional Airport 15 miles to the northwest. Pinal Airpark is also within the metropolitan area. There are two Interstate highways in the metropolitan area. Interstate 10 runs southeast from Phoenix through Marana, passes west of downtown, and continues east toward El Paso. Interstate 19 leaves the I-10 south of downtown and heads south to the Mexican border. Arizona State Route 210 is a shorter expressway that links downtown with Davis-Monthan Air Force Base and Tucson's southeast side. Tucson does not have a beltway system, and relies almost entirely on surface streets. Cycling is popular in Tucson due to its flat terrain and dry climate. Tucson and Pima County maintain an extensive network of marked bike routes, signal crossings, on-street bike lanes, mountain-biking trails, and dedicated shared-use paths. The Loop is a network of seven linear parks comprising over 100 mi (160 km) of paved, vehicle-free trails that encircles the majority of the city with links to Marana and Oro Valley. The Tucson-Pima County Bicycle Advisory Committee (TPCBAC) serves in an advisory capacity to local governments on issues relating to bicycle recreation, transportation, and safety. The League of American Bicyclists awarded Tuscon a gold rating for bicycle-friendliness in 2006. ^ "Annexations | Official website of the City of Tucson". Tucsonaz.gov. Retrieved April 21, 2017. ^ a b "American FactFinder". United States Census Bureau. Retrieved May 25, 2018. ^ a b "Find a County". National Association of Counties. Retrieved June 7, 2011. ^ "Metropolitan and Micropolitan Statistical Areas". Qedfinancialsystems.com. Retrieved February 8, 2018. ^ Tom Beal. "Tucson Oddity: What's with crater on edge of 'A' Mountain?". The Arizona Daily Star. Retrieved July 7, 2018. ^ Thiel, J. Homer; Diehl, Michael W. "Cultural History of the Tucson Basin and the Project Area" (PDF). Retrieved October 3, 2017. ^ "The Hohokam". Arizona Museum of Natural History. Retrieved October 3, 2017. ^ Mabry, Jonathan B.; Thiel, J. Homer (1995). "A thousand years of irrigation in Tucson" (PDF). Archaeology in Tucson (Fall 1995). Center of Desert Archaeology. Retrieved October 3, 2017. ^ a b Wright, Erik J. (October 2010). "'"Yes, Here I am Again! Tucson's Prize Bandit of 1878: William W. Brazelton'". Wild West History Association: Journal. 3 (5): 43–48. ^ Barra, Alan (December 1998). "Who Was Wyatt Earp?". 49 (8). American Heritage Magazine. Archived from the original on May 7, 2006. ^ David Leighton. "Street Smarts: Few Tucsonans saw Wyatt Earp as hero". The Arizona Daily Star. Retrieved September 14, 2016. ^ "Another Assassination Frank Stilwell Found Dead this Morning Being Another Chapter in the Earp-Clanton Tragedy". Tombstone, Arizona. March 27, 1882. p. 4. ^ "Race and Hispanic Origin for Selected Cities and Other Places: Earliest Census to 1990". U.S. Census Bureau. Archived from the original on August 6, 2012. Retrieved January 4, 2012. ^ Rogers, Frank B. (1969). "THE RISE AND DECLINE OF THE ALTITUDE THERAPY OF TUBERCULOSIS". Bulletin of the History of Medicine. 43 (1): 1–16. JSTOR 44447350. PMID 4887472. ^ "Feliz Cumpleaños (Happy Birthday) Tucson! - Carolyn's Community". Tucsoncitizen.com. August 20, 2010. Archived from the original on July 21, 2012. Retrieved October 27, 2011. ^ "KTUS Tucson International Airport Tucson, Arizona, USA". Airnav.com. Retrieved January 22, 2012. ^ Barrio historico Tucson. Retrieved 2010-03-12. ^ David Leighton. "Street Smarts: 'Well, I hardly knew what to think of the place' was Tucsonan's first impression". The Arizona Daily Star. Retrieved July 7, 2018. ^ David Leighton. "Street Smarts: Feldman brought family to Tucson after 1870s economic crash". The Arizona Daily Star. Retrieved September 14, 2016. ^ Rob O'Dell (October 29, 2010). "Azstarnet.com". Arizona Daily Star. Retrieved January 22, 2012. ^ "Kvoa.com". Kvoa.com. June 23, 2010. Archived from the original on December 27, 2011. Retrieved January 22, 2012. ^ Arrival of the Southern Pacific Railroad in Tucson Archived January 26, 2011, at the Wayback Machine on the east side. Retrieved 2010-03-12. ^ "Tucson Neighbourhoods, Locations and Districts: Locations in Tucson Area, AZ, USA". Tucson.world-guides.com. Retrieved October 27, 2011. ^ Tucson, U.S.A. | Emporis.com. Retrieved 2010-03-12. ^ El Charro Café. Retrieved 2010-03-12. ^ David Leighton. "Street Smarts: Before arena, road named for "Pop" McKale". The Arizona Daily Star. Retrieved September 14, 2016. ^ David Leighton. "Street Smarts: Speedway's sports racing roots". The Arizona Daily Star. Retrieved July 7, 2018. ^ David Leighton. "Street Smarts: Barraza worked to unify Arizona miners". The Arizona Daily Star. Retrieved September 14, 2016. ^ David Leighton. "Street Smarts: Bloody murder, buried money in town's history". The Arizona Daily Star. Retrieved September 14, 2016. ^ David Leighton. "Street Smarts: Starr Pass Blvd. has telegraph-line link". The Arizona Daily Star. Retrieved September 14, 2016. ^ Old West Tucson. Old West Tucson. Retrieved on 2013-07-12. ^ David Leighton. "Street Smarts: How Oracle Road came to be named for a fast ship with a teetotaling crew". The Arizona Daily Star. Retrieved July 7, 2018. ^ David Leighton. "Harold Bell Wright the inspiration for Tucson neighborhood". The Arizona Daily Star. Retrieved September 14, 2016. ^ David Leighton. "Street Smarts: Country Club, Golf Links used to be one road". The Arizona Daily Star. Retrieved September 14, 2016. ^ David Leighton. "Engineer-businessman Craycroft built impressive home for its time". The Arizona Daily Star. Retrieved September 14, 2016. ^ David Leighton. "Street Smarts: Civano honors notable Tucsonans who gave to their community". Arizona Daily Star. Retrieved July 7, 2018. ^ David Leighton. "Street Smarts: Highway, mountain named for botanist". Arizona Daily Star. Retrieved July 7, 2018. ^ University of Arizona Opens Sky Center To Public (Press Release at VisitTucson.org). Retrieved 2010-12-16. ^ McKnight & Hess, pp. 212 ff, "Climate Zones and Types: Dry Climates (Zone B)". ^ Harris, RB; Griffith, K; Moon, TE (2001). "Trends in the incidence of nonmelanoma skin cancers in southeastern Arizona, 1985-1996". J Am Acad Dermatol. 45 (4): 528–36. doi:10.1067/mjd.2001.114742. PMID 11568742. ^ NWS Tucson Office Monsoon tracker. Retrieved 2010-03-12. ^ Two underpasses leading towards downtown Tucson from the north, at Sixth Avenue and Stone Avenue, have such "feet of water" scales. ^ Arizona State Legislature, ARS 28-910, Liability for emergency responses in flood areas; definitions. Retrieved 2010-03-12. ^ "Tucson snow to give way to warmer weather, clearer skies through weekend". Tucson. ^ "Inches of snow, frigid temperatures chill Southern Arizona". Tucson.com. ^ Tucson University of Arizona, Arizona – Climate Summary. Retrieved 2010-03-12. ^ Tucso WSO AP, Arizona – Climate Summary. Retrieved 2010-03-12. ^ "NowData - NOAA Online Weather Data". Retrieved February 2, 2012. ^ "Station Name: AZ TUCSON INTL AP". National Oceanic and Atmospheric Administration. Retrieved April 21, 2014. ^ "WMO Climate Normals for TUCSON/INT'L ARPT AZ 1961–1990". National Oceanic and Atmospheric Administration. Retrieved March 10, 2014. ^ "Monthly Averages for Tucson, AZ". Retrieved March 28, 2011. ^ a b "Arizona - Race and Hispanic Origin for Selected Cities and Other Places: Earliest Census to 1990". U.S. Census Bureau. Archived from the original on August 6, 2012. ^ a b "Tucson (city), Arizona". State & County QuickFacts. U.S. Census Bureau. ^ "Feds give OK to new Ariz. congressional maps". Inside Tucson Business. Retrieved February 2, 2013. ^ David Leighton. "Street Smarts: Tucson's biggest manufacturing plant was almost built in Phoenix". Arizona Daily Star. Retrieved July 7, 2018. ^ Fischer, Alan D. ""Optics Valley: Can Tucson stay king of the hill?"". Archived from the original on December 25, 2007. Retrieved August 25, 2006. CS1 maint: BOT: original-url status unknown (link) Arizona Daily Star. Retrieved 2010-03-12. ^ Long, Levy J. (October 10, 2006). ""Luxury labels: Tiffany, Louis Vuitton could inspire more high-end retailers to try Tucson."". Archived from the original on May 28, 2008. Retrieved December 29, 2007. Arizona Daily Star. Retrieved 2010-03-12. ^ "City of Tucson 2016 Comprehensive Annual Financial Report" (PDF). October 8, 2017. p. 179. Retrieved October 8, 2017. ^ Tucson Gem and Mineral Society. Retrieved 2010-03-12. ^ "Tucson Festival of Books now 4th largest book fair in U.S." Archived from the original on April 18, 2012. Retrieved March 9, 2013. ^ "Tucson Festival of Books: Exhibitors". Archived from the original on March 13, 2013. Retrieved March 9, 2013. ^ "Tucson Festival of Books Founder's Award". Archived from the original on March 11, 2013. Retrieved April 30, 2018. ^ The Tucson Folk Festival homepage. Retrieved 2010-03-12. ^ David Leighton. "Street Smarts: Kramer Ave. named for winter visitor who helped start rodeo, parade in 1925". The Arizona Daily Star. Retrieved July 7, 2018. ^ "The Tucson Rodeo Parade". Archived from the original on March 1, 2010. Retrieved March 12, 2010. ^ Tucson Meet Yourself, Tucson Festival, Tucson Folk Arts, Tucson Entertainment. Retrieved 2010-03-12. ^ "Tucson Modernism Week". Tucsonmod.com. Retrieved September 14, 2016. ^ Westerman, Kim (2011). Explorer's Guide Tucson: A Great Destination (Explorer's Great Destinations). The Countryman Press. pp. 38–39. ISBN 9781581579093. ^ MobileReference (2007). Encyclopedia of Observances, Holidays and Celebrations. MobileReference Series. pp. 198–199. ISBN 9781605011776. ^ a b c Herreras, Mari. "All Souls, All Community: Tucson's heart exposes itself every All Souls Procession". Tucson Weekly. Retrieved November 13, 2013. ^ Regan, Margaret (November 5, 2009). "To Mourn and to Honor: The All Souls Procession enters its third decade of helping Tucsonans deal with death". Tucson Weekly. Retrieved November 13, 2013. ^ Regan, Margaret. "Ninety and Nimble". Tucson Weekly. Tucson, Arizona. October 7, 2004. ^ "History". The Gaslight Theatre. Retrieved December 13, 2014. ^ "T-Model Hank Rides and Tucson Boys Sing". Moving Image Archive News. July 28, 2015. Retrieved January 14, 2019. ^ "Tucson Arizona Boys Chorus (video)". KGUN-TV. December 8, 2016. Retrieved January 14, 2019. ^ "History". Tucson Girls Chorus. Retrieved January 16, 2019. ^ Tatum, Charles M. (August 2, 2001). Chicano Popular Culture: Que Hable el Pueblo. The Mexican American Experience. University of Arizona Press. p. 46. ISBN 978-0816519835. ^ Rosendtadt, Jose (April 26, 2007). "Mariachi: 25 years of greatness". Tucson Citizen. p. Calendar. Archived from the original on October 11, 2014. Retrieved December 1, 2014. ^ "Critics' Choice Awards: Best Band or Artist: Calexico". Tucson Weekly. June 29, 2006. Retrieved March 12, 2010. ^ Alpers, Jackie. "Welcome to Tucson: 10 Must-Try Mexican-Inspired Dishes", Food Network. Retrieved April 10, 2016. ^ Arellano, Gustavo (March 6, 2018). "Why Doesn't Tucson's Mexican Food Scene Get More National Attention?" WAMU. Retrieved March 28, 2018. ^ Downing, Renée (July 27, 2006). "The Birth of Tucson Cuisine", Tucson Weekly. Retrieved April 10, 2016. ^ Tersigni, Jennifer (October 16, 2014). "Must Try: 12 Amazing Ethnic Dishes from All Over Tucson", Tucson Foodie. Retrieved April 10, 2016. ^ "Tucson, UNESCO City of Gastronomy". www.tucsonaz.gov. Archived from the original on December 3, 2018. Retrieved October 3, 2018. ^ Berlin, Andi (December 11, 2015). "UNESCO Designates Tucson as World City of Gastronomy", Arizona Daily Star. Retrieved August 27, 2016. ^ Severson, Kim (August 23, 2016). "Tucson Becomes an Unlikely Food Star", The New York Times. Retrieved August 27, 2016. ^ Nevarez, Griselda (August 15, 2015). "Tucson's Savory Invention: The Sonoran Hot Dog", NBC News. Retrieved April 10, 2016. ^ Robbins, Ted (August 6, 2009). "The Sonoran Hotdog Crosses the Border", NPR. Retrieved April 10, 2016. ^ Edge, John T. (August 25, 2009). "In Praise of the All-American Mexican Hot Dog", The New York Times. Retrieved April 10, 2016. ^ Jim Turner. "Life in the Old Pueblo: Here's how Tucson came to own its charming nickname". Arizona Daily Star. Retrieved July 7, 2018. ^ "'The Sunshine Factory' Picked as New Nickname for Tucson". Ocala Star-Banner. Ocala, Florida. Associated Press. November 15, 1981. p. 11A. ^ Abel, Barbara (January 8, 1984). "There's more to Tucson than Sun, Guns, Scenery". The Milwakee Journal. pp. Travel 1–4. ^ Liou, Koutsai T. (1998). Handbook of economic development. CRC Press. p. 205. ISBN 0-8247-0181-X. ^ "College News Updates". College Media Networks. Retrieved January 22, 2012. ^ Finley, Patrick (December 29, 2011). "Tucson Padres owner to look at selling team". Arizona Daily Star. Retrieved January 22, 2012. ^ Trotto, Sarah (April 16, 2011). "TUCSON PADRES NOTEBOOK: Moorad: Kino may be a long-term option". Arizona Daily Star. Retrieved January 22, 2012. ^ "The USHA Hall of Fame". United States Handball Association. Archived from the original on August 2, 2012. Retrieved September 29, 2012. ^ Duffy, Jennifer (December 17, 2005). "The women of the Tucson Monsoon are 'tackling football'". Tucson.com. Retrieved January 13, 2016. ^ Rivera, Andrea (January 28, 2009). "She Devils plan on full contact". Tucson.com. Retrieved January 13, 2016. ^ David Leighton. "Street Smarts: Giant boot marks spot of road named for Restaurant owning family". Arizona Daily Star. Retrieved July 7, 2018. ^ Ryan Finlay (September 20, 2018). "Sweet: Tucson's new Indoor Football League team picks a name with local significance". tucson.com. ^ "CNN.com Election 2004". Cnn.com. Retrieved July 7, 2018. ^ "Local and National Election Results - Election Center 2008 - Elections & Politics from CNN.com". Cnn.com. Retrieved July 7, 2018. ^ "2008 General Election - Ballot Measures". Web.archive.org. November 1, 2011. Archived from the original on November 1, 2011. Retrieved July 7, 2018. ^ Walkley, A. J. (July 19, 2013). "Civil Unions in Tucson". Huffington Post. Retrieved July 28, 2018. ^ Star, Arizona Daily Star Arizona Daily. "Tucson expands domestic-partner registry". Arizona Daily Star. Retrieved July 28, 2018. ^ "Feds give OK to new Ariz. congressional maps". Inside Tucson Business. April 13, 2012. Retrieved February 2, 2013. ^ "TUCSON Post Office™ Location". Web.archive.org. March 9, 2010. Archived from the original on March 9, 2010. Retrieved July 7, 2018. ^ "Arizona Legislature | Ballot Access News". ballot-access.org. Retrieved January 5, 2018. ^ "Mayor Bob Walkup - City of Tucson Web". Web.archive.org. February 13, 2010. Archived from the original on February 13, 2010. Retrieved July 7, 2018. ^ "Ward 1 - Councilor Regina Romero | Official website of the City of Tucson". Tucsonaz.gov. Retrieved April 21, 2017. ^ "Ward 2 Councilmember Paul Cunningham | Official website of the City of Tucson". Tucsonaz.gov. Retrieved April 21, 2017. ^ "SUMMARY REPORT CONSOLIDATED 2017 REPORT-EL45 : FINAL RESULTS" (PDF). Webcms.pima.gov. Retrieved July 7, 2018. ^ "Ward 3 - Council Member Karin Uhlich | Official website of the City of Tucson". Tucsonaz.gov. Retrieved April 21, 2017. ^ a b "2015 Primary 8/31 : Registered Voters : 225,105" (PDF). Tucsonaz.gov. Retrieved July 7, 2018. ^ "Council Member Shirley C. Scott | Official website of the City of Tucson". Tucsonaz.gov. Retrieved April 21, 2017. ^ "Ward 5 - Council Member Richard Fimbres | Official website of the City of Tucson". Tucsonaz.gov. Retrieved April 21, 2017. ^ "Council Member Steve Kozachik | Official website of the City of Tucson". Tucsonaz.gov. Retrieved April 21, 2017. ^ "Tucson College - Technical Schools & Career Training in Arizona". Tucsoncollege,edu. Retrieved September 14, 2016. ^ "Arizona School of Acupuncture and Oriental Medicine, ...................... Acupuncture School, Acupuncture Clinic ASAOM - Arizona School of Acupuncture and Oriental Medicine, ...................... Acupuncture School, Acupuncture Clinic". ASAOM. Retrieved July 7, 2018. ^ "Tucson Campus of Wayland Baptist University - Christian Universities in Arizona". Wbu.edu. Retrieved September 14, 2016. ^ "www.azstarnet.com ®". Web.archive.org. August 22, 2009. Archived from the original on August 22, 2009. Retrieved July 7, 2018. ^ Holmes, Gary. "Local Television Market Universe Estimates" (PDF). Nielsen. The Nielsen Company. September 24, 2016. Retrieved October 8, 2017. ^ Vanderpool, Tim. "Polluting the Poor:TEP's southside coal plant keeps on pumping out noxious gases". Tucson Weekly. Retrieved December 27, 2013. ^ 050910. "D-M awards solar photovoltaic utility contract to SunEdison". Dm.af.mil. Archived from the original on September 29, 2011. Retrieved October 27, 2011. ^ "Tech Parks Arizona-research park and business incubator". Uatechpark.org. Retrieved July 7, 2018. ^ "Arizona's Water: Uses and Sources". Arizona Experience. Retrieved December 27, 2013. ^ "Light Pollution – Tucson/Pima County, AZ". The Public Good. January 12, 2009. ^ "Pima County approves changes to lighting ordinance". KVOA.com. March 13, 2012. Archived from the original on November 5, 2013. ^ "2012 City of Tucson/Pima County Outdoor Lighting Code" (PDF). Pima County Development Services. Archived from the original (PDF) on October 14, 2013. ^ "About Tucson Water". M.tucsonaz.gov. Archived from the original on March 29, 2014. Retrieved December 13, 2014. ^ a b "Reclaimed Water". City of Tucson. 2012. Archived from the original on May 5, 2012. Retrieved March 22, 2012. ^ "Clearwater Frequently Asked Questions | The Official Website for the City of Tucson, Arizona". Cms3.tucsonaz.gov. Archived from the original on November 5, 2011. Retrieved October 27, 2011. ^ "Tucson Water's Long Range Water Resource Planning" (PDF). City of Tucson. Retrieved January 22, 2012. ^ "Federal Transit Administration Gives Approval to the Tucson Modern Streetcar Project" (Press release). Tucson Department of Transportation. October 1, 2009. Archived from the original on May 27, 2010. Retrieved March 12, 2010. ^ "Tucson Streetcar Debuts to Crowds, Hot Weather". Arizona Public Media. Arizona Board of Regents. July 25, 2014. Archived from the original on October 6, 2014. Retrieved October 24, 2014. ^ Wichner, David (June 27, 2013). "Alaska Airlines to launch Tucson-Portland nonstop". Arizona Daily Star. ^ "162nd Fighter Wing Fact Sheet". 162nd Fighter Wing Public Affairs. July 3, 2012. Archived from the original on July 14, 2014. ^ Kreutz, Douglas (April 28, 2015). "New segment of The Loop trail opens Saturday with a fiesta". Arizoan Daily Star. ^ ""The Loop 2014 Annual Report: The First 100 Miles"" (PDF). Pima County. ^ "League Names New Bicycle Friendly Communities". April 24, 2006. Archived from the original on March 15, 2010. Retrieved March 12, 2010. ^ "Tucson Sister Cities". Interactive City Directory. Sister Cities International. Archived from the original on October 4, 2013. Retrieved September 4, 2013.
Cooper, Evelyn S., 1995, Tucson in Focus: The Buehman Studio. Arizona Historical Society, Tucson. (ISBN 0-910037-35-3). Spanish Colonial Tucson, Dobyns, Henry F, 1976, University of Arizona Press, Tucson. ISBN 0-8165-0546-2. Drachman, Roy P., 1999, From Cowtown to Desert Metropolis: Ninety Years of Arizona Memories. Whitewing Press, San Francisco. (ISBN 1-888965-02-9). Hand, George, 1995, Whiskey, Six-Guns and Red-Light Ladies. High Lonesome Books, Silver City, New Mexico. (ISBN 0-944383-30-0). Hand, George, 1996, The Civil War in Apacheland. High Lonesome Books, Silver City, New Mexico. (ISBN 0-944383-36-X). Harte, John Bret, 2001, Tucson: Portrait of a Desert Pueblo. American Historical Press, Sun Valley, California. (ISBN 1-892724-25-1). Henry, Bonnie, 1992, Another Tucson. Arizona Daily Star, Tucson. (ISBN 0-9607758-2-X). Kalt III, William D., 2007, Tucson Was a Railroad Town., VTD Rail Publishing, Tucson. (ISBN 978-0-9719915-4-5). McIntyre, Allan J. and the Arizona Historical Society, 2008, The Tohono O'odham and Pimeria Alta., Arcadia Publishing, Charleston, South Carolina. (ISBN 978-0-7385-5633-8). Moisés, Rosalio, 2001, The Tall Candle: The Personal Chronicle of a Yaqui Indian. University of Nebraska Press. (ISBN 0-8032-0747-6). Painter, Muriel Thayer, 1971, A Yaqui Easter. University of Arizona Press, Tucson. (ISBN 0-8165-0168-8). Read online. Ronstadt, Edward E. (editor), 1993, Borderman: The Memoirs of Federico Jose Maria Ronstadt. University of New Mexico Press, Albuquerque. (ISBN 0-8263-1462-7) Read online. Sheaffer, Jack and Steve Emerine, 1985, Jack Sheaffer's Tucson, 1945–1965. Arizona Daily Star, Tucson. (ISBN 0-9607758-1-1). Sheridan, Thomas E., 1992, Los Tucsonenses: The Mexican Community in Tucson, 1854–1941. University of Arizona Press, Tucson. (ISBN 0-8165-1298-1). Sonnichsen, C. L., 1987, Tucson: The Life and Times of an American City. University of Oklahoma Press, Norman. (ISBN 0-8061-2042-8). Woodward, Richard B. (January 3, 2010). "36 Hours in Tucson, Ariz". The New York Times. Retrieved January 2, 2010. Woosley, Anne I. and the Arizona Historical Society: 2008, Early Tucson. Arcadia Publishing, Charleston, South Carolina. (ISBN 0-7385-5646-7). "Tucson, Arizona". C-SPAN Cities Tour. November 2016.